For one night, it was everything that we'd imagined all the way back in that disgusting and tactless and exhilarating and enervating and exhausting and enticing summer of 2010. There was LeBron James making all sorts of quick and heady plays, working as some ungodly amalgamation of all the legends and champions that had come before him. There were Dwyane Wade and Chris Bosh, finishing broken plays with unbroken precision. There was that miserable Miami PA announcer, yelling out the "dos minutos" to a crowd that couldn't be bothered. There were the weak-side blocks, not from Joel Anthony or Udonis Haslem but from Wade and James swooping in from seemingly nowhere. There were the role players, the ones that had failed the Heat over the last two seasons as much as LeBron failed his team in the 2011 Finals, putting the thing away. There were the Miami Heat, NBA champions at last. Doing exactly what they had to do to down the Oklahoma City Thunder, finally aligning their play expertly with all that the team's critics had chucked at them since things got real in October of 2010. Scaring everyone who cared to watch along the way. Finally. And not before significant and potentially defeating frightening factors, even if you only bothered to dial this team up in early spring. As late as last week, we doubted the Heat's supporting cast so much that we called the series in Oklahoma City's favor. As late as the first week of June, following a sometimes-there Game 5 of the Eastern conference finals, we wondered if LeBron was going to glide his team out of the postseason for the third year in a row. As late as late May, we wondered if Dwyane Wade was healthy enough to be relied upon. 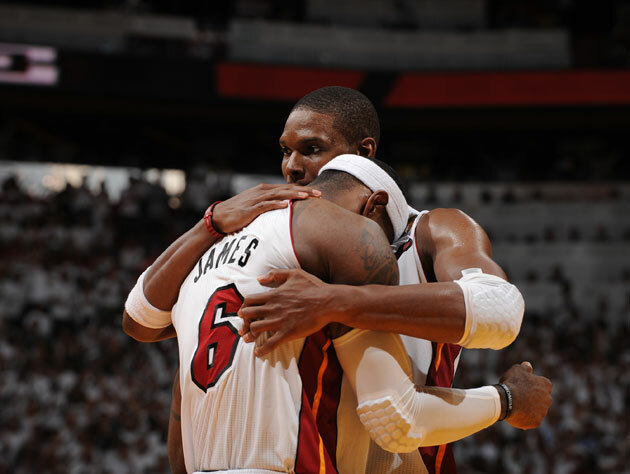 As late as mid-May, we wondered if we would see Chris Bosh play again in 2011-12, following his abdominal strain. As late as early November, we wondered if we would see an actual NBA season. We wonder no more. Because it all came together. We doubt it was a function of Oklahoma City's failings, though there was quite a bit they could have done better both in this mostly-close series and especially that blowout Game 5. No, this was because the Miami Heat finally found a way to create a seamless offensive setup that created something that was greater than the sum of its. It wasn't quite the 1970s New York Knicks or 1990s Chicago Bulls-style of gestalt, but it was more than enough. Mainly because LeBron James played absolutely perfect basketball. As it's been since Game 6 of his team's tilt with Boston, with a brief (like, maybe, three possession) blip in Game 1 of the Finals, LeBron James has done everything that he's had to do to create a dominant winner out of a Miami Heat team that still has significant enough cracks in the support that surrounds its formidable foundation. If this was a best of 11, we've no doubt that Shane Battier, Mario Chalmers and Mike Miller's shooting would regress a bit, so it isn't as if the Heat ever found that magic or that effortless chemistry. But behind LeBron's brilliance, though, that never mattered. Because he did it his way, and our way. He mixed it up, in Games 4 and 5 of these Finals, hitting open teammate after open teammate. That's his way. Our way was asking The Man to do things more quickly, to play more aggressively in consideration of the limitations of his teammates. To do it from the post. To act like the gunner, when he had to. Finally, he put it all together. Because even the superhuman can learn from mere mortals. It says so much that on a team that featured Miller, Battier, and Chalmers combining to shoot 12-19 from long range, in a contest that featured excellent defense and 24 points from Chris Bosh, and another gutty 20 points on 12 shots from Dwyane Wade, that this really is all about LeBron James. Not because he overcame all the storylines and silliness and criticism (both deserved and otherwise), but because he made this his own. He dominated. He controlled these NBA Finals and won his team a championship not by emulating Michael Jordan or Oscar Robertson or Kobe Bryant or Magic Johnson or some hope about what we hope That Swell Guy Kevin Durant will turn into, but by being himself. Himself at his best, 12 months after LeBron as something less. Got-damn, it was glorious. This season wasn't. It was painful. It was, for months at a time as the NBA created a needlessly compacted schedule to overcome its own avarice, pointless. It wasn't fun, for the most part, and that's me talking. These Finals were, though. They may have ended a few days earlier than we'd hoped, but it was a spectacular make-up call. And the fact that LeBron James finally and consistently was able to pair teammates that deserved to share a court with him and his own decision to unleash a consistently aggressive and unrelenting streak that matched revs with his sublime talents? Could you ask for anything better than that? Two more games, perhaps. Greedy sods, we are. This is different, this time around. There will be a season next year. It will start on time, there will be a better strain of revenue sharing, there will be smarter people running NBA teams, and the 2012-13 campaign that tips off in four and a half months will resemble the NBA we've grown to grow and love over the last 65 years. And so, as I've done in each of these BtBs stretching back to the one I wrote after Kobe won his first ring a dozen years ago, I'll ask your hand in doing it all over again next season. Because you're the type that can get as weepy watching Juwan Howard's 12-inch vertical jump for joy after winning his first title as you do a Kings/Grizzlies game gone completely perfect in January. Because you're with us, in this, weirdly. Because this game does something to you — for reasons that you both can't understand but also don't have enough minutes left in your lifetime to detail. We don't want it to end, either. And after a season like this, that's saying something. We have the Miami Heat and Oklahoma City Thunder to thank for that. Kevin Durant's tears, in exhaustion, to thank for that. LeBron James' unyielding brilliance, pitched at the absolute right time, to thank for that. More than anything, we have you to thank for that.